March 10, 1866: The future Archbishop Arseny Chagovtsov was born in Kharkov, in what was then the Russian Empire and what is today Ukraine. A widowed priest, he became a monk and came to America in 1903 to serve in the Russian North American Mission. He was instrumental in the establishment of St. Tikhon’s Monastery in 1906, and in 1908 he was assigned to be the administrator of Russian churches in Canada. Arseny — at this point an archimandrite — returned to Russia in 1910, fled to Serbia after the Revolution, and, in 1926, was chosen to return to Canada as the Bishop of Winnipeg. In 1936, he was apparently shot (I don’t really know about the details of his incident). After this, he retired from the episcopate and ultimately moved to St. Tikhon’s Monastery in Pennsylvania, where he was involved in founding what became St. Tikhon’s Seminary. Archbishop Arseny died in 1945. 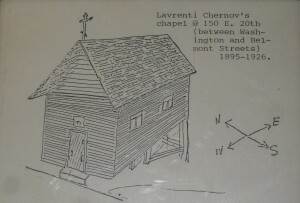 Sketch of Holy Trinity chapel in Portland, OR, founded by Lavrenty Chernov. Image courtesy of St. Nicholas Orthodox Church in Portland. March 10, 1895: Fr. Sebastian Dabovich dedicated Holy Trinity Orthodox chapel in Portland, OR. The small Portland community included Greeks, Syrians, and Russians, among others. 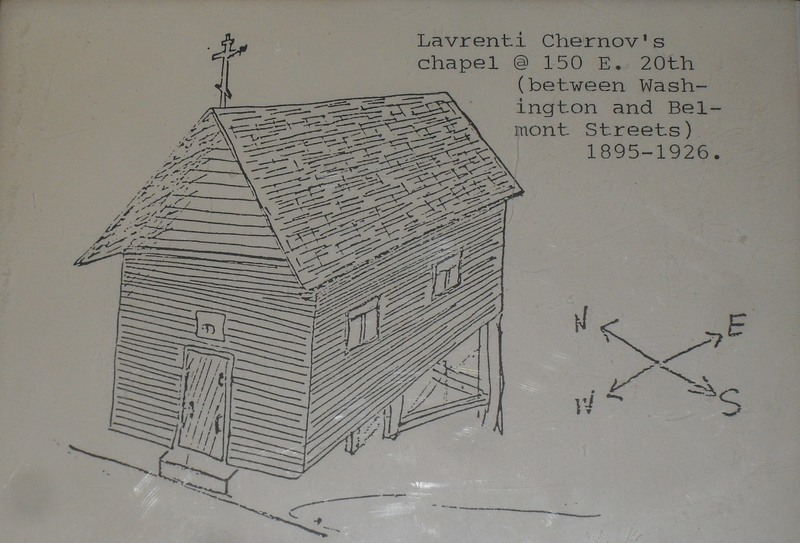 The man most responsible for its establishment was a layman named Lavrenty Chernov. An Alaskan Creole, Chernov was born in 1848 and eventually moved to Portland. The ramshackle chapel was used for perhaps a decade, but it eventually fell out of use. In the first decade of the 20th century, the Greeks of Portland began using it for their own church, which was also called Holy Trinity. March 5-7, 1907: The Russian Archdiocese held its first “All-American Sobor” in Mayfield, PA. A few years ago, OCA archivist Alex Liberovsky gave a nice lecture on the Sobor, which you can read on the OCA website. The Sobor was held concurrently with the convention of the Russian Orthodox Catholic Mutual Aid Society. And while it was called “All-American,” it was a purely “Russian” affair: the other ethnic groups affiliated with the Russian Archdiocese, such as the Syro-Arabs and the Serbs, were not included. That said, the Sobor was a major step for the Russian Mission in America. March 7, 1915: The funeral for St. Raphael Hawaweeny was held in his Brooklyn cathedral. Something interesting, which I’d never noticed before: St. Raphael was apparently friends with an American named Gary Cronan, who got permission from the New York Heath Administration to have St. Raphael buried in a crypt in St. Nicholas Cathedral. Cronan reportedly built the crypt himself. (My source for this is the unpublished St. Vladimir’s Seminary M.Div. thesis by A. Issa.) St. Raphael actually didn’t rest in the crypt for very long — Bishop Aftimios Ofiesh acquired a new cathedral in 1920, and St. Raphael’s relics were transferred to Mount Olivet Cemetery in 1922. Today they rest at the Antiochian Village in Ligonier, PA. Anyway, I’m really curious to learn more about Gary Cronan. Back in December, we reprinted Isabel Hapgood’s very good New York Tribune article on Raphael’s death and funeral. UPDATE: To listen to a podcast based on this article, click here. March 5-7, 1907: The Russian Archdiocese held its first “All-American Sobor” in Mayfield, PA [20 February / 5 March (Tuesday) – 23 February / 8 March (Friday)].